Chocolate Coconut Banana Bread. Who doesn’t like a nice slice of homemade banana bread? Just the smell of it baking makes my mouth water. I have several healthy banana bread recipes on my blog already, but I had never combined banana, chocolate and coconut together. I finally combined those flavors making this chocolate banana bread. 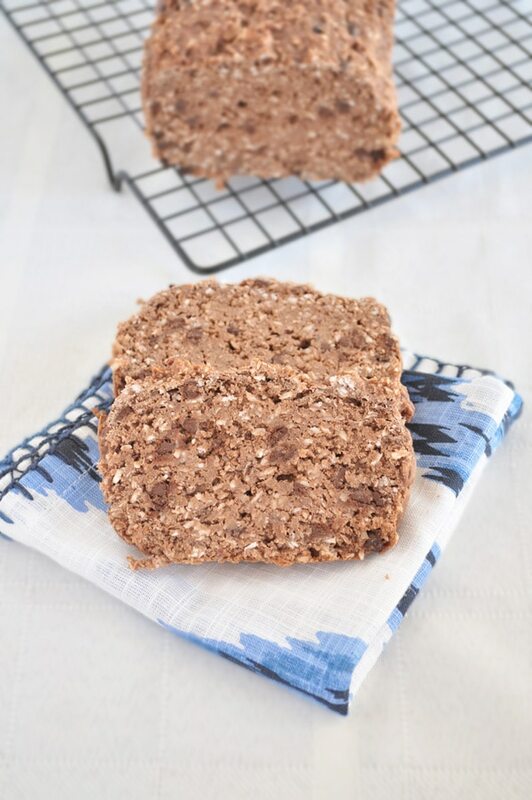 This healthy chocolate coconut banana bread is oil free and has very little added maple syrup. I use 3 VERY ripe bananas which helped add a natural sweetness to this. Needless to say, ours was gone in just 2 days! Using the extra rip bananas helped keep this bread nice and moist without the addition of oil. This super easy banana bread recipe is vegan and gluten free. You could even make a double batch and freeze some. It freezes very well. I hope you enjoy it. Chocolate, coconut and banana go so well together in this easy banana bread recipe! Pour batter into a parchment lined loaf pan. I used a 9 inch loaf pan . Wait until the bread has completely cooled before removing from the pan. Store this bread in the fridge. It should last a week or two. You can also freeze it for longer storage. Enjoy! I want to try this but want to replace the bananas with puree'd pumpkin. What's your recommendation as to how much much pumpkin to use? Thank you!! I'm not sure. Maybe 1 1/2 cups pumpkin? This looks amazing and I can't wait to try it! I'll probably make my own flour, and can I substitute agave nectar for maple syrup with the same amount? (I just want to use what I have).Thanks! I do love banana bread and this one looks really good!!! Do you have a recipe for a healthy pumpkin bread? Would like to have one to make, I love pumpkin anything this time of year. Thank you!!!! I haven't, but I may try. Do you make the plum puree yourself? Like a date paste? Hello,can I substitute the coconut with something else? You can probably omit it and add a little more cocoa powder. Did you use coconut milk from a can or a carton for this recipe? I made the recipe into standard sized muffins and baked for 18 minutes and they turned out great! Thank you! Yes I did. Glad you liked the recipe! Can or Carton for the coconut milk? Either will work, but it will come out better with canned coconut milk.